Emphasizing physics over mathematics, this popular, classroom-tested text helps advanced undergraduates acquire a sound physical understanding of wave phenomena. This second edition of Oscillations and Waves: An Introduction contains new widgets, animations in Python, and exercises, as well as updated chapter content throughout; continuing to ease the difficult transition for students between lower-division courses that mostly encompass algebraic equations and upper-division courses that rely on differential equations. Assuming familiarity with the laws of physics and college-level mathematics, the author covers aspects of optics that crucially depend on the wave-like nature of light, such as wave optics. Examples explore discrete mechanical, optical, and quantum mechanical systems; continuous gases, fluids, and elastic solids; electronic circuits; and electromagnetic waves. The text also introduces the conventional complex representation of oscillations and waves during the discussion of quantum mechanical waves. Richard Fitzpatrick is a professor of physics at the University of Texas at Austin, where he has been a faculty member since 1994. He is a member of the Royal Astronomical Society, a fellow of the American Physical Society, and the author of Maxwell's Equations and the Principles of Electromagnetism (2008), An Introduction to Celestial Mechanics (2012), Plasma Physics: An Introduction (2014), and Quantum Mechanics (2015). "Oscillations and waves are ubiquitous in many physical situations. Universities now realise that instead of discussing these phenomena in different branches of physics, it is much more productive to have a core physics undergraduate course which encapsulates the reach physical phenomena such as advection, dispersion, diffraction, as well as non-linearity (solitons, shocks and chaos) in a single, generic course that encompasses the relevant elements of fluid dynamics, mechanics, optics, plasmas and quantum mechanics. There are surprisingly few good and more importantly recent, up-to-date textbooks available on the subject of Oscillations and Waves. Richard Fitzpatrick's Oscillations and Waves: An Introduction is an excellent addition to the existing literature on the subject. The book provides a clear, systematic, comprehensive and yet concise treatment of the subject. The emphasis is placed on physical interpretation rather than mathematical rigour, although the author certainly presents the material at the right mathematical level, commensurate with an advanced undergraduate course. The book will be equally useful for physics and engineering students, as well as mathematics students who want to get physical insight beyond the mathematical equations. The book benefits from very useful exercises which are accompanied by a solutions manual. 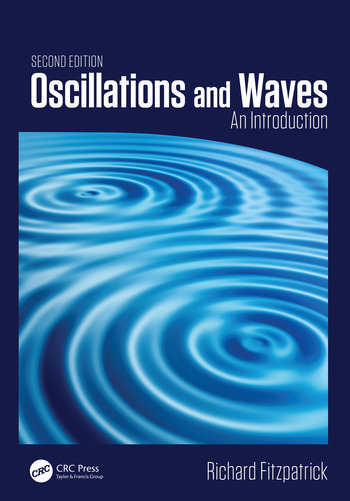 As a physics educator, I would recommend this book without a reservation to both lecturers as excellent teaching material and to students as a learning resource which will guide them through the exciting world of waves, oscillations and patterns that are all around us." "… The treatment is thorough … An unusual approach of the book is to postpone any use of complex representations until they are needed under the topic of quantum mechanics. The author argues that this allows the text to stress physical interpretations over mathematical solutions. Each chapter includes homework problems. Summing Up: Recommended. Lower- and upper-division undergraduates.